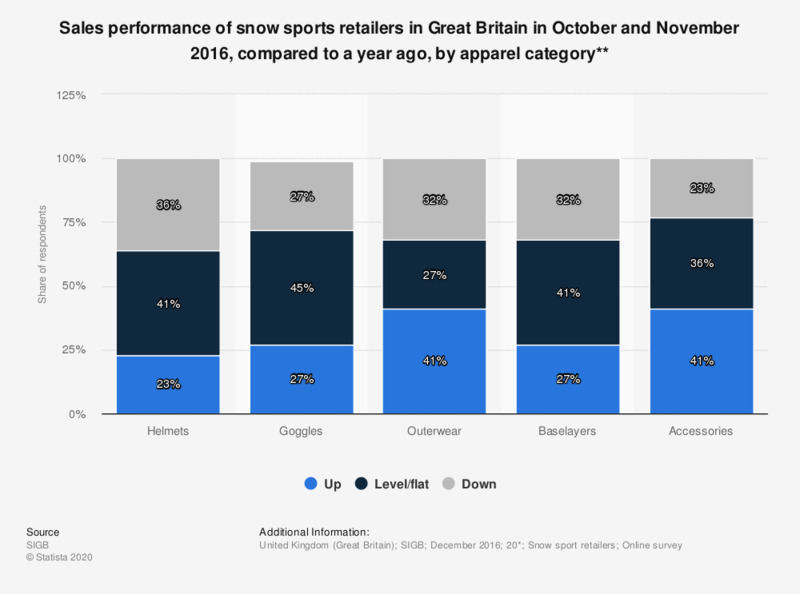 This statistic shows the results of a survey asking snow sports retailers in Great Britain how well their sales of apparel and accessory items performed in October/November 2016 compared to the same period a year ago. Accessories appeared to perform best out of all the categories, with 41 percent of retailers stating that sales were up on the same period last year and 36 percent saying they remained level. Outerwear was also up by 41 percent. * Survey distributed to members of the Snowsport Trade via email newsletter and via social media. Retailers made up 48 percent of total survey respondents (total n = 46). ** Responding retailers were asked the following question in regards to sales of each item: "How have sales this winter so far (Oct/Nov) compared to the same period last year in the following categories? ".